We are proud to announce the first of its kind one-click Restaurant Menu Translator. 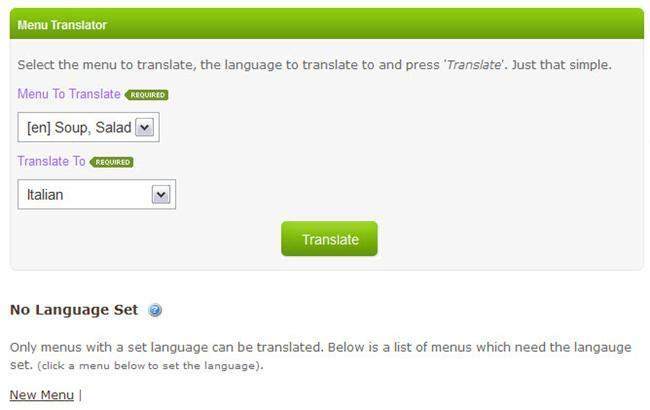 Our Menu Translator can translate the language of your menu to and from over 60 languages with a simple select and click to translate. Here at OpenMenu we are working hard to build, and support, a global menu platform and this latest release will help restaurants build menus that support multiple languages with the ease of a single click. Everything about OpenMenu is keeping it simple, quick and powerful for restaurants and our Menu Translator is no different. This new feature is being rolled out in our Premium Plus accounts and is easily accessed from the restaurants page in our power OpenMenu Creator. If you’re a restaurant and don’t have an account on OpenMenu check out our signup page and see what cool things you can do on our powerful platform.